Squaw Valley, CA - It's been 15 years since the Mazda3 was first introduced. The most recent generation arrived in 2014 and was guided by the Kodo philosophy that takes its inspiration from a hunting wild animal, a predator in search of its prey. Ok, we admit it takes a bit of imagination to see this in the lines of the car, but listen long enough to the Mazda designer’s explanations and you can almost see the beast. For Kudo 2.0, Mazda takes inspiration from the art domain to carve out a nobler look for its compact car. While the sedan is more traditional, the hatchback Sport model is clearly inspired by the Kai concept that was introduced at the Detroit Auto Show in 2018. It’s a more radical approach that I expect most people will either love or hate. Personally, I always salute those who dare to be different, especially in the automotive domain, and that’s exactly what the Sport model is. 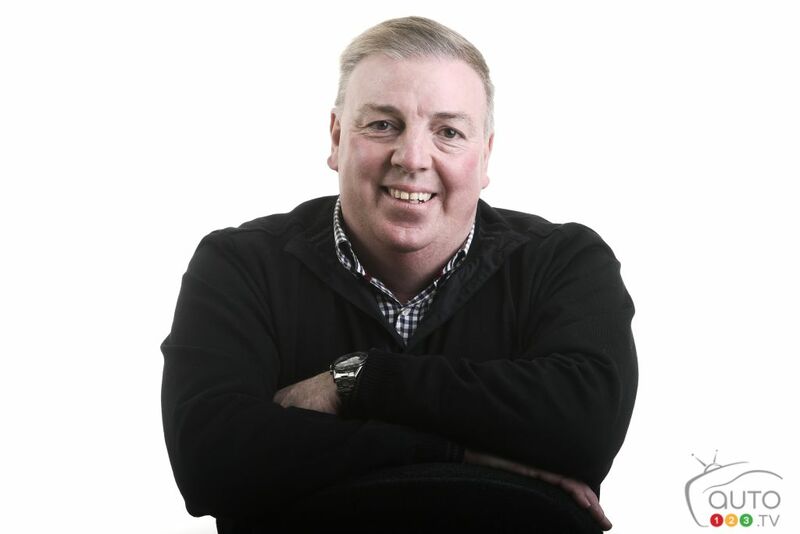 That daring applies not just to the contours, but to the platform, which is brand new, and to the introduction of an all-wheel-drive system that will undoubtedly attract a brand-new clientele. I almost sense that the company’s Japanese engineers had a little meeting with some Swedish counterparts before designing the interior. There’s a sleek side to the car's finishing that gives it both a simpler approach and a higher-end fit and finish, and it definitely makes the new Mazda3 feel more upscale. The materials used are of better quality, and the centre screen is bigger at 8.8 inches and comes standard in all models. The designers have purposely moved the screen away from the driver to eliminate distraction. 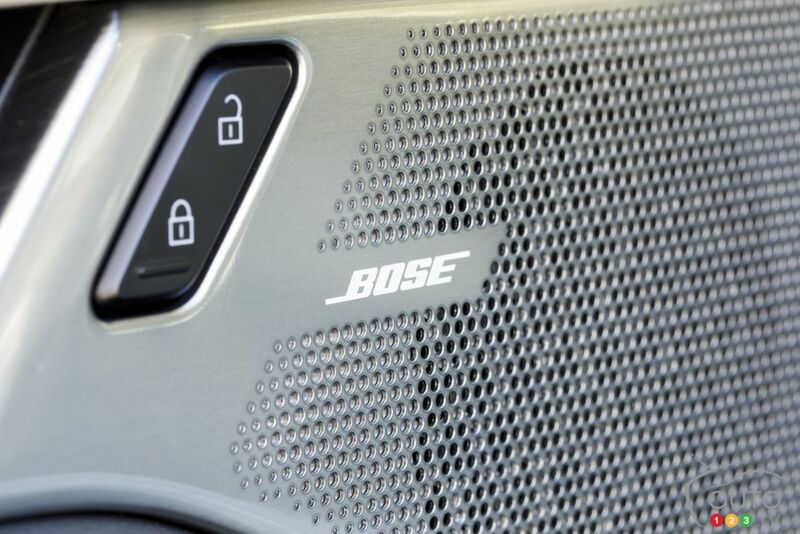 Plus, it’s not a touchscreen; you use a knob to scroll through the menu. 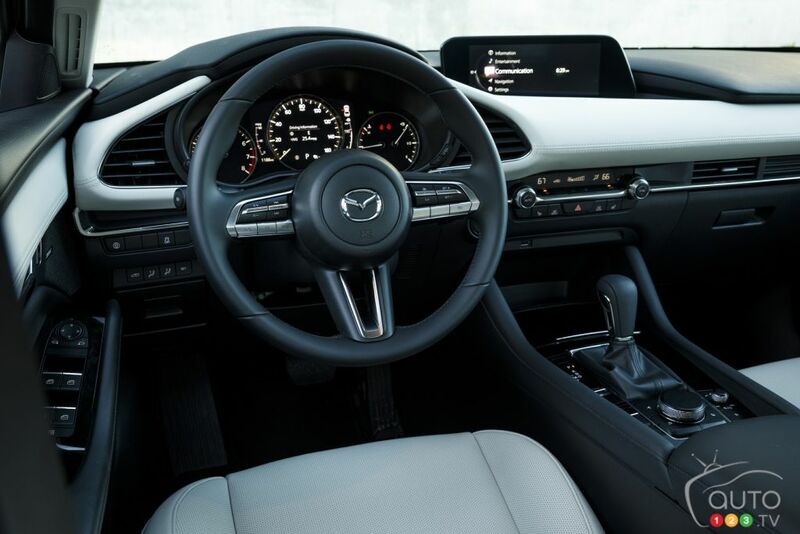 Mazda also added Android Auto and Apple Carplay integration standard on all models. The on-screen menu is relatively easy to use and the gauges in front of the driver are digital and configurable. Many efforts have been made to create a harmony between man and machine in this car. 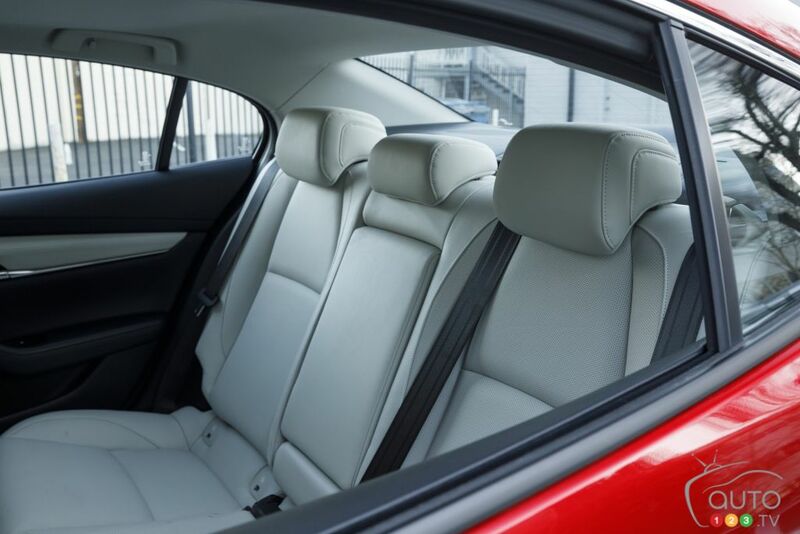 Sound insulation is by far the best of any car in the category, the audio system's sound is aimed at passengers and the woofers usually in the door panel was moved into the A panel, eliminating the usual buzzing and distortion. All of the commands have also been reconsidered and placed so that everything is within easy reach. These are the kinds of small details that make you feel good being in this interior. The shape of the roof limits the space available for rear passengers in the Sport version and the cargo space is not very big. If either of those elements matter much to you, you'll be better served with the sedan than with the hatchback. 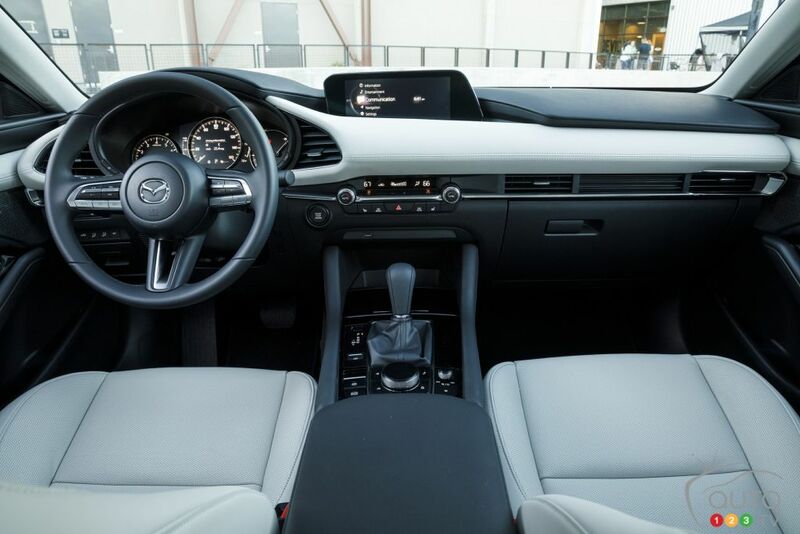 The 2019 Mazda3 also benefits from more safety features than before, such as blind spot monitoring with standard rear cross traffic alert on all models - except for in the standard GX sedan, where it's offered as an option. The GS and GT versions include adaptive cruise control and lane keeping assist, as well as an alarm for driver drowsiness. For the moment, the 2019 Mazda3 is offered with the same engines as last year’s model. The 155 hp 2.0L engine is still the basic offering in the GX version. The 6-speed manual gearbox is still in the catalog, still complemented by the optional 6-speed automatic. The other engine is the 2.5L, 186-hp with 6-speed automatic transmission. The big deal that has not yet been confirmed is the 2.0L SKYACTIV-X engine. Mazda has already announced its arrival in Europe where environmental standards are more severe. However, it’s not yet known if this engine will find its way to America. The approach is quite innovative. Called Sky Spark Controlled Compression Ignition (SPCCI), this engine uses the traditional spark ignition of a gasoline engine and a diesel-type compression ignition cycle to deliver superior fuel economy, reduced emissions and improved power. With a very high pressure rate, gasoline is diffused in haze, reducing fuel consumption by more than 15% (according to Mazda) and decreasing emissions by the same amount thanks to the high efficiency of the system that more cleanly burns the fuel. The big news regarding the car’s driving dynamics is the arrival of a 4WD system in the GS and GT versions and the independent rear suspension that has given way to a torsion beam. The first of those, the i-Activ all-wheel drive, drives the front wheels under normal conditions but can transfer up to 50% of power to the rear wheels when conditions require it and works with the Mazda G-Vectoring Control Plus system. This system reduces the engine torque to load the front tires when cornering. When the car exits, it adjusts the front outside wheel to put back the Mazda3 on the right path. On wet and snowy mountain roads, we had ideal conditions to test the all-wheel drive and found that it responded well. And for those who are worried about the disappearance of the multi-link suspension in favor of a torsion beam, we did not see any difference on the road. Mazda made this change to facilitate adding AWD, and it also improves lateral stiffness by 78%. This Mazda 3 is not only the quietest compact car on the market, its driving behavior compares favorably with that of a Volkswagen, which will delight those who like to get involved with the act of driving when they’re behind the wheel. The basic GX version of the 2019 Mazda3 starts at $18,000 with a manual gearbox. The cheapest 4WD version goes for $26,200. For this price you earn yourself an AWD GS version. Note that for the same price you also get a better-equipped GT version, albeit with front-wheel drive. A well-equipped GT 4WD version sells for $ 31,400. With its new look, classy interior, engine choices and all-wheel-drive availability, the latest Mazda3 is once again the benchmark in its segment and has all the ingredients to regain its rock star status.